Gardening Fun with New Deco Planters! 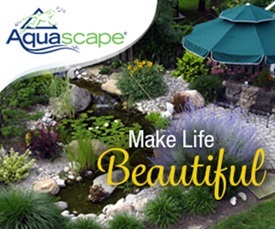 Some of you know that I have a marketing job with Aquascape Inc., a water gardening company. 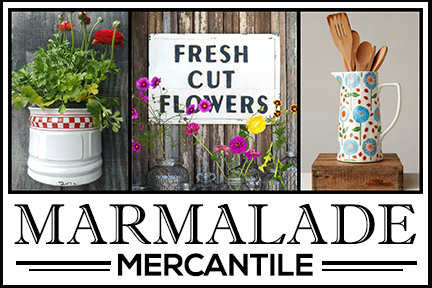 We recently launched these cute Water Creations Deco Planters that you can purchase online or from select retail stores. I asked to take some home so I could plant them up and share them with you. 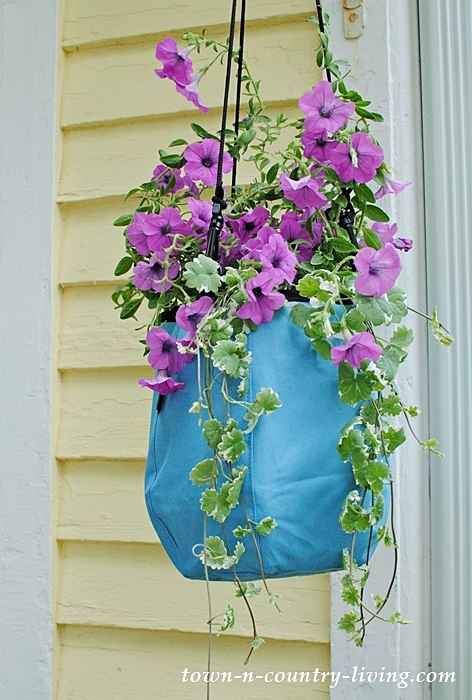 For the soil planter, I tucked purple Petunias and a Creeping Charlie in the Hanging Deco Planter. I wrapped a couple stems of the petunia plant around the ropes, encouraging the flowers to vine up as well as trail down. 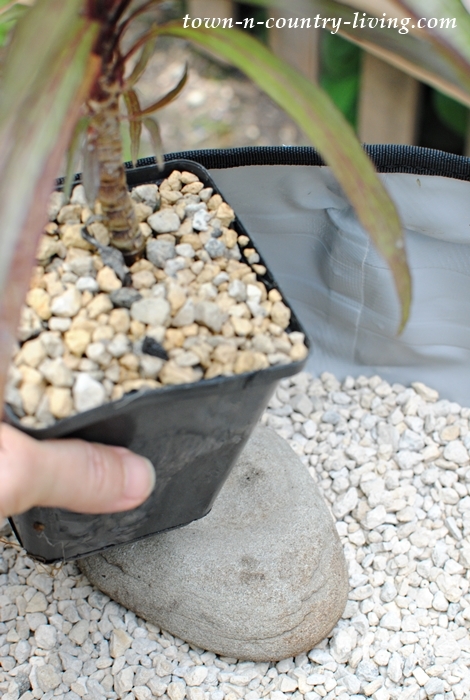 Be sure to add a layer of small rocks in the bottom of the bag before adding soil, to allow for proper drainage. 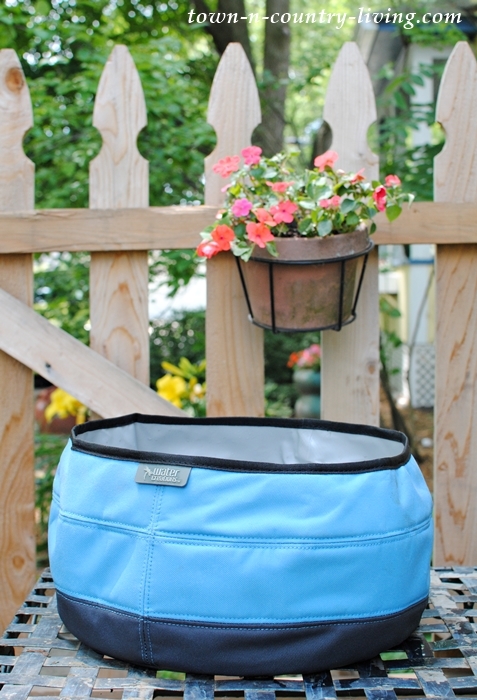 Since the planters are designed for both water and soil containers, there aren’t any holes in the bottom. 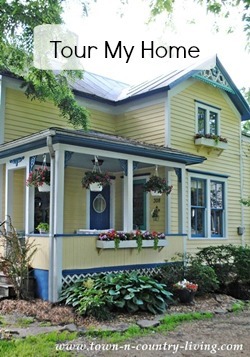 The color of the Deco Planter complements my yellow house with blue trim. 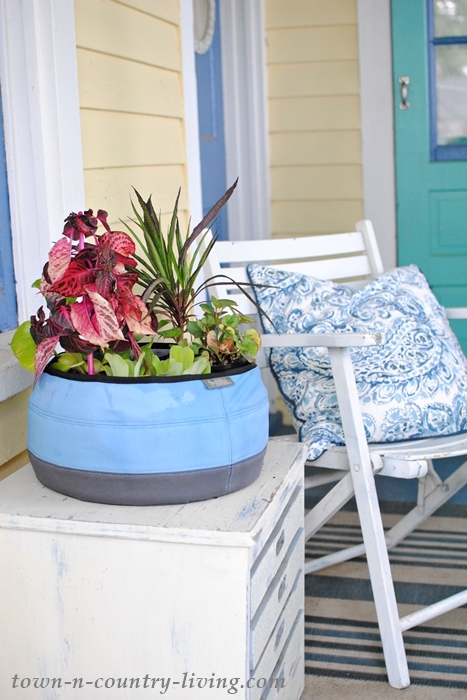 The planters also come in gray and red. 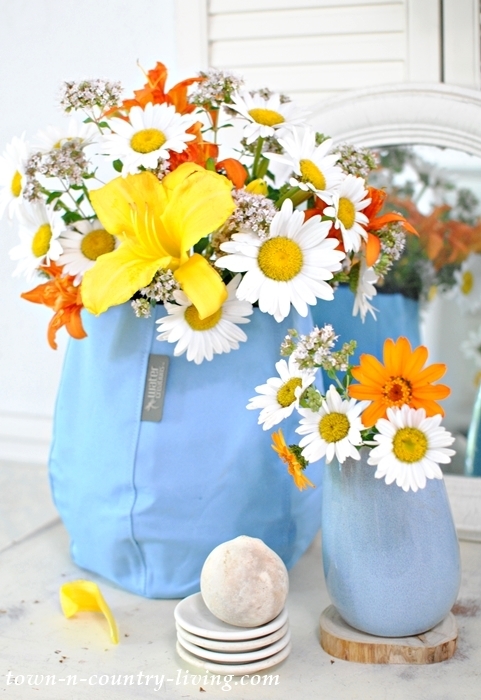 Since the Hanging Deco Planter is water-tight, I thought it’d make a great vase, too! 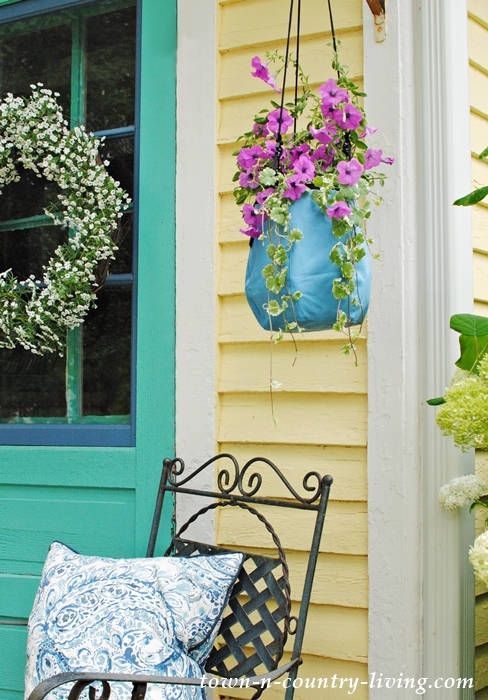 The hanging rope is attached to the planter with clips so it’s easy to remove, which I did when using it as a vase. All of these glorious flowers are from my garden. I love that my cutting garden is in full bloom. I used lilies, daisies, and oregano. Some of my oregano started flowering and adds the slightest hint of cool lavender to the flower arrangement. 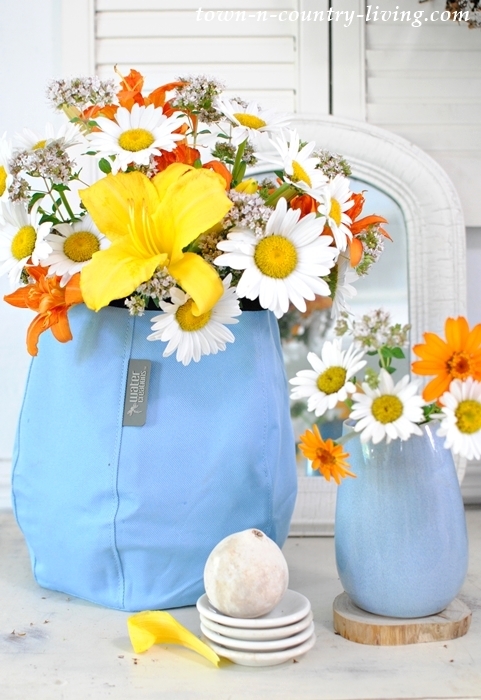 My little blue leaning vase is a perfect match for the Deco Planter! 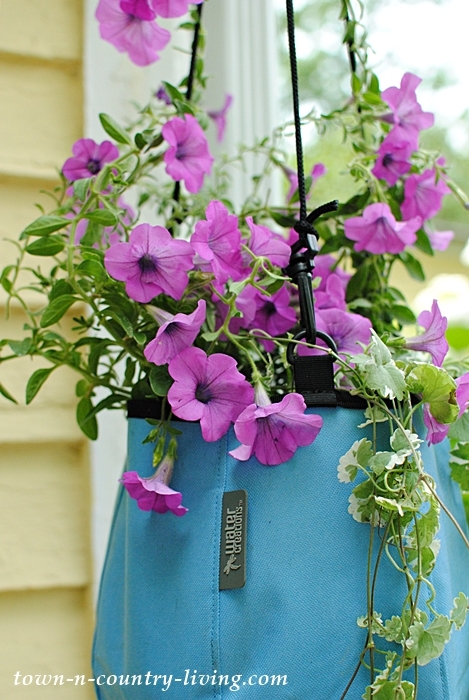 Have you ever created a container water garden? 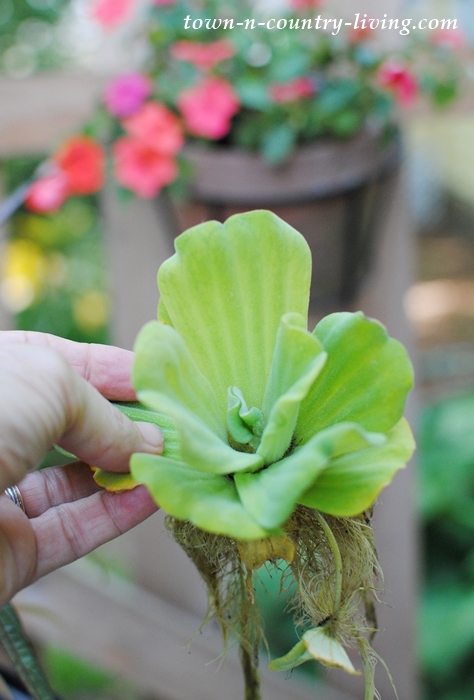 It’s easy to create and allows you to broaden your gardening options beyond terrestrial plants. The Large Deco Planter is perfect for a table-top mini pond. I spread a thin layer of washed gravel on the bottom of my Deco Planter. You don’t have to do this – but I wanted to elevate the plants a bit. Some of the plants needed even more elevation so I placed a flat rock from the garden to get the potted pond plant to the right height. 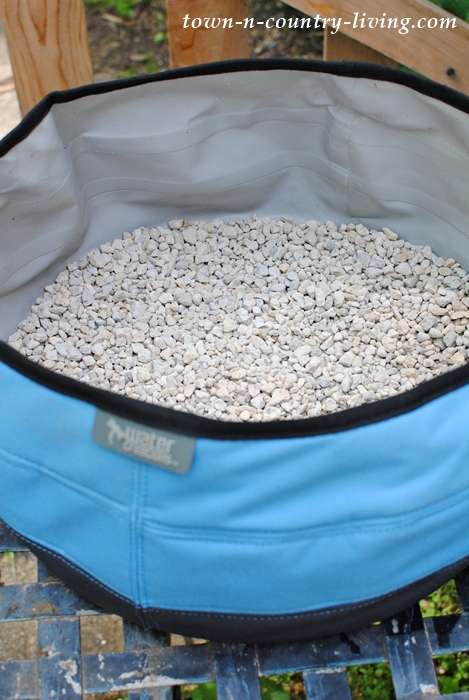 Add a thin layer of gravel to the top of the pot to keep the dirt from escaping into the water after you fill the container. 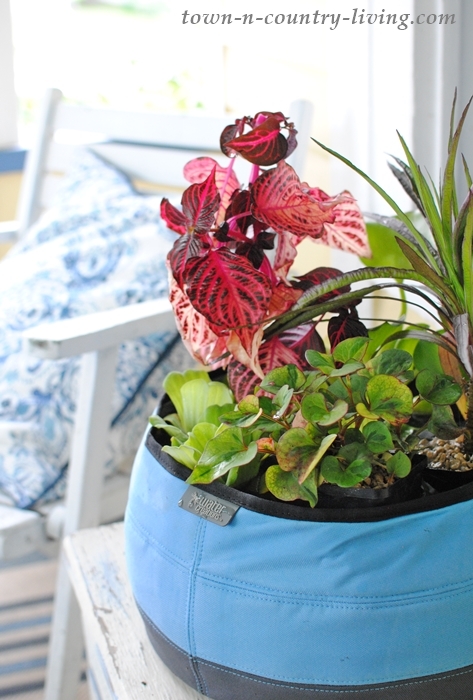 After the potted aquatic plants are placed in the Deco Planter, add water to the container. Make sure you choose plants that like moist soil. Marginal pond plants are a good choice. You can usually find them at garden centers that carry pond supplies. 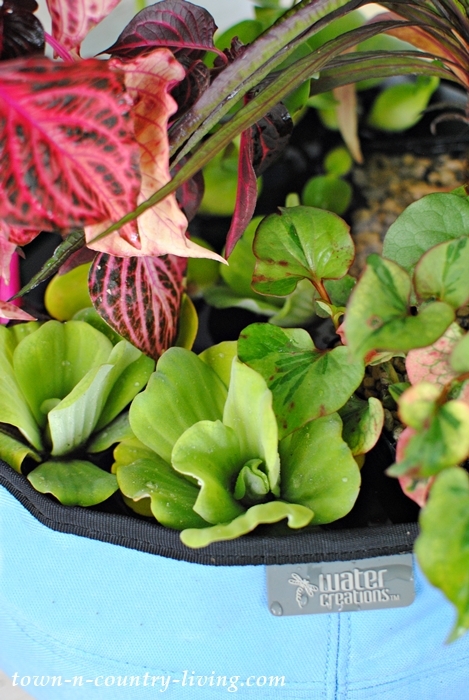 After you fill your container with water, add a couple of floating aquatic plants like water lettuce. They float on the water’s surface while their roots dangle in the water. I love water lettuce – they look like little rosettes. The spikey plant is Dwarf Blue Bells and will bear flowers like a small petunia. I placed my container water garden on my trash-to-treasure game table. The small potted plant in front is a Chameleon Plant. I think a Deco Planter filled with solely with water lettuce would be pretty too. 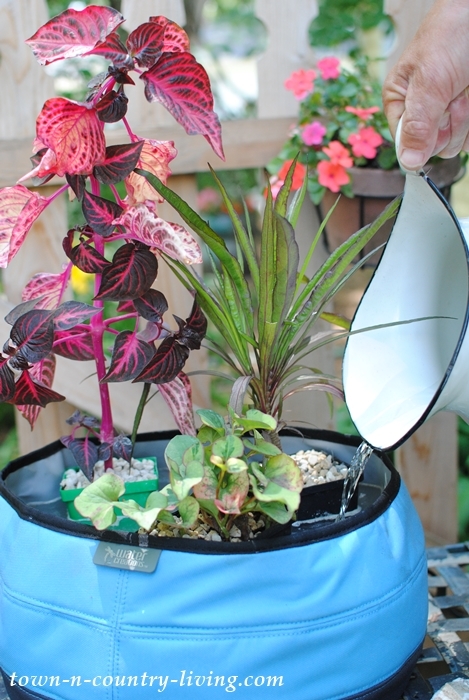 A huge advantage of container water gardens is they require a lot less watering than their soil counterparts. If you’re worried about mosquitoes, you can add a Mosquito Dunk to the container. Here’s a short, fun video that shows other options for the Deco Planters. 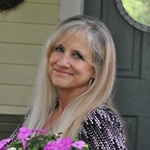 My co-worker Lisa created the video. She’s so talented! 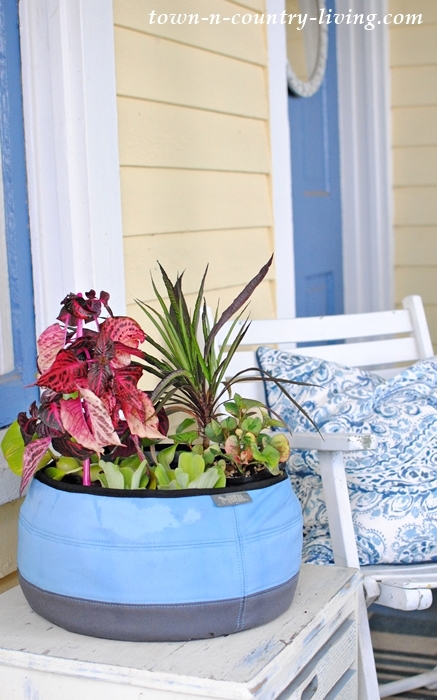 Let me know what you think of these new Deco Planters! Wow that looks so interesting and much easier to take care of. 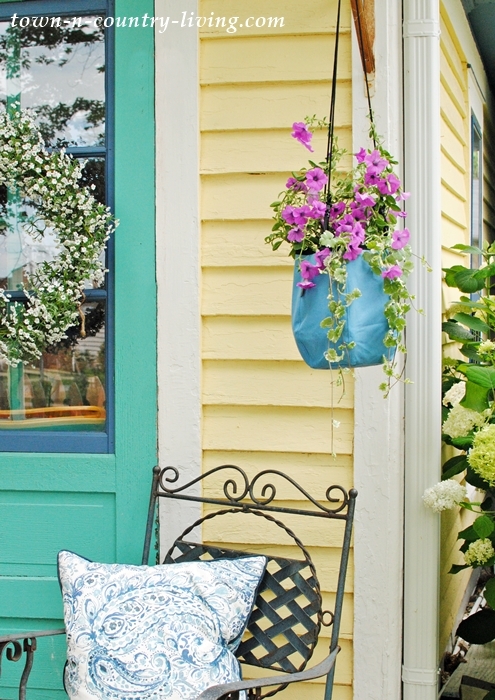 The planters are certainly attractive, look easy to work with once planting is done. Is this what you work with on your job? Enjoy rest of week.. All your cut flowers look gorgeous. So bright and pretty. Your flowers are such a nice touch. I can’t wait for mine to bloom! Wow thats really cool. I like that they come in different colors. This would be great for a summer home where you can take the plants with you easily or even a house boat. The best part its unbreakable. These look amazing and I’ll have to share with my daughter who lives in Texas and can’t seem to get her houseplants to thrive in the heat of her patio! Those planters are so cute, lots of ideas going through my mind as how to use them. Love brainstorming new products that people share. 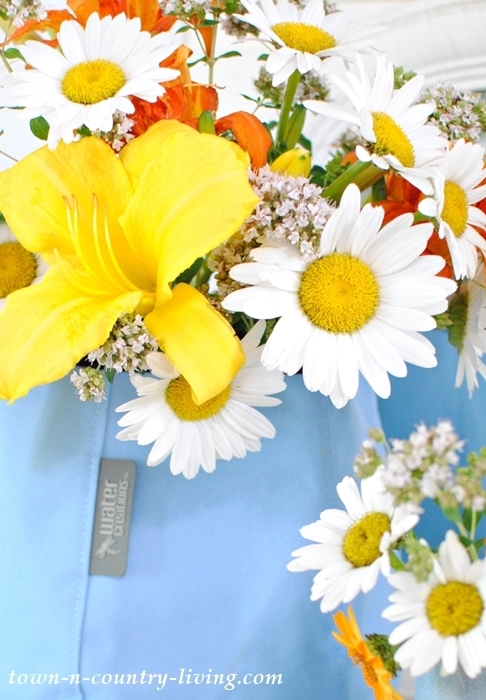 You flower garden must be so beautiful right now in full bloom.